If you’ve got a pet that roams freely in and out of your house, you may find yourself wanting to more closely regulate how they come and go. [tareker] was looking to keep his cat indoors at night when dangerous animals might be lurking in the neighborhood, but he didn’t want it to become a hassle. He already had locking pet door on hand, which he hacked to regulate the egress and ingress of his cat automatically. He installed a pair of reed switches to determine if the door had been opened outwards (cat leaving) or inwards (cat returning), keeping track of the state using an Arduino Nano. A servo motor attached to the door’s frame locks the door whenever it detects the cat is safely inside after nightfall. While he also added an RGB LED to reflect the status of the door, he’s considering connecting it to the Internet so that he can control and check the door from wherever he might be at the moment. The instructable reads that’s the sort of door that was hacked, to be automated. This doesn’t address intruders. What if someone else’s cat, or some other animal entered? This would throw everything off, and your cat would be trapped outside. Maybe an RFID on the collar would help? I saw a project a long time ago that used a camera to look at the cat’s silhouette as it entered the door frame. As I recall, the goal was twofold: Prevent the cat from bringing in catches/kills and prevent another animal from entering through the door. Hacking a door that senses a magnetic collar would guard against most intruders, not so much the cat bringing in a take out meal. Something like this could mess with fluffy’s and Tom’s love life. Whenever I see a cat door project Fred Flintstone comes to mind. That would be Flo Control. You could use an induction loop to read data off the cat’s RFID tag and match it to the “allowed” list. In Australia, all pets generally have these if they have been to a vet and the system is standardised nationally (in the US it is different depending on the state?). They run off a slightly different frequency than regular RFID – you can get a reading using standard 125kHz but if you change the capacitor in series with your coil to get a 134.2kHz range you should be able to pick up the cat by having a coil above the cat-flap. it already exhists. DIY version? So, what happens if last thing at night the cat follows you in through the front door instead of using the catflap? what happens if the cat (or another animal?) pokes its head through but decides not to enter. My cat used to do this all the time…. This would register as an entry and the cat would then be locked out until morning. Animals and dumb electronics are never a good combination. Rofl! @sawo Yeah, this is a good idea, but commercial products already do this. If you don’t have the money to buy said commercial products then all credit to the OP. What I’d like to see someone do is a scanner which can detect lost cats at say 100 foot range using a modified grid dip detector. That would be a whole new category of ownage. Maybe you were thinking about the Flo cam? About 10yrs ago. yea at a minimum it should be set to entry-only instead of locked at night. Forget the intruders, what about the cat itself? Cat flap usage is learned behavior and you have to post them through the thing a fair few times before they get the gist of what its about, then what if the cat unlearns that it can go out via the flap, or will it have comprehension and a sense of time of day to know if the flap is openable or not at that particular time. I potentially see a lot of cat trying to barge the flap open and little accidents on the floor near the door. I’d be interested in a update after a few months use from the poster to see if the above is baseless worry, or something that might create issue. Based on my RTFI, the complaints above regarding “locking the cat outside” are all uninformed. I believe the door only prevents egress at certain times…the cat can come inside any time. It does create another possible problem…many pet door owners don’t realize that they often host guests during the night. Opossums, skunks, and raccoons all enjoy cat food, and have been known to use the pet door to grab a snack from a pet’s food bowl. This particular modification would then trap the animal indoors, a situation that could quickly escalate into a disaster. dunno about you, but i’d actually like to trap them and give them a good scare or something, make sure they never do it again. You would seriously let random animals just lurk into your house ? Having a pet door basically requires you to know this can happen, and be OK with it. I wouldn’t…but anyway they’ll run off if you approach or they hear you coming. If the door is locked, now you have a trapped animal inside your house. It only takes a few seconds for a scared, trapped animal to totally lose control and go on the offensive. Do you really want to trap one skunk in your kitchen to give it a scare? Wow! Yes, you are right it will make sure you never do it again. A third of the time my cat goes out, for some reason he pulls his kitteh-door open towards the inside with a claw, and peers out first. I wonder how common that is, with this system my cat would occasionally become locked out at night because his bizarre antics would trick the controller. 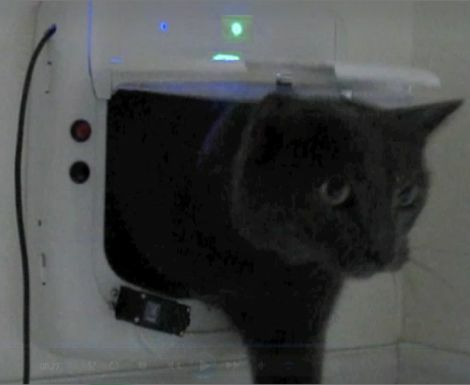 with a proper rfid reader which doesnt grill your cat but can read the tag from a distance wide enough so the cat can enter without being blocked out would be a good solution. What if you have more than one cat?